Has the power gone out at your place in the past year? Are you more or less prepared for being without electricity for a while? I’ve got five tips. With the power grid vulnerable to a variety of events, it’s a good idea to set things up so you can do okay if your power is out for a while. UPDATE: Since I wrote this, newsman Ted Koppel has written Lights Out, a sobering book about the risk of longer term power outages. Here is my review of it on this website. 1. If there is any room to spare in your refrigerator, keep it full by having plastic containers or glass jars of water in it. We keep all the beer that’s in the house in our fridge — it looks like we are ready for a party, but it’s just how we do it. Also, on the bottom shelf, the one just above the produce section, we keep a couple of squarish plastic containers filled with water. We do something similar in the freezing compartment of the refrigerator. This gives us extra time when outages occur, not to mention that it probably saves us a tiny bit on our power bills. Also, open the refrigerator as little as possible when the power is out. We’ve never lost any food to spoilage but do be aware of that risk. 2. Speaking of food and water, be sure you have some on hand. If your kitchen stove is electric, you might want to have a way to heat food that doesn’t rely on electricity, like a camp stove. 3. Depending on the weather when the power goes out, you may need to be able to keep warm or to stay cool. If you have a wood stove or fireplace, keep wood and matches on hand even if you aren’t regularly having fires. In cold weather, put on more layers of clothing, and in warm weather, wear less and keep cool by drinking more water or other beverages. Patting your face and arms with a damp washcloth is a surprisingly effective way to stay cool. 4. When the power is out, a battery-powered radio is handy to check on the news, provided you have batteries. That reminds me — have one or more flashlights with batteries. There are solar-powered ones too. Candles can be handy too. 5. Without electricity, a lot of what you ordinarily do can’t be done. You can’t use your television or the internet. It can get a little boring. If you have children, think of games and crafts that they can get involved in. Adults can enjoy this kind of thing too! I have a happy memory of roasting marshmallows over candles with my mom and sister during a hurricane when I was about ten. 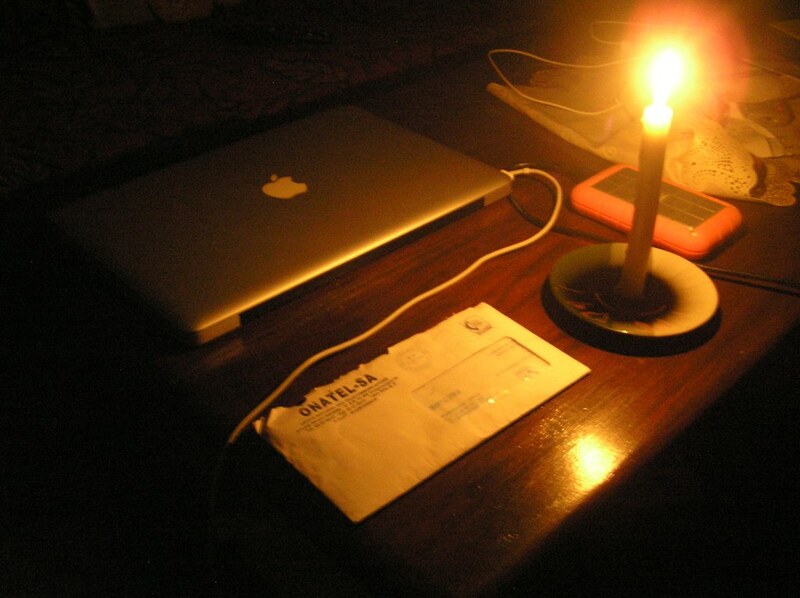 These tips should help with the relatively ordinary, run-of-the mill power outages that can happen. Of course, having solar panels can help too. One Saturday night, we had friends over for dinner in the earthbag house we built in Colorado. We ate and talked for hours. Eventually one of the guests had to go to the bathroom. She came back into the kitchen and said that the power was out in the bathroom. Well, it turned out that the power had been out in most of the house and all over town for a couple of hours. We hadn’t even known it because the lights in our kitchen and living room were solar powered.